The hotter the spark, the easier your engine will start, and this 40,000 volt coil is just the ticket to a quick start! 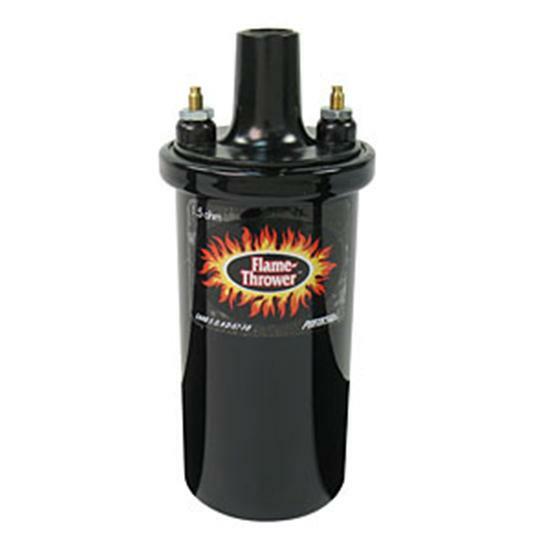 Its higher voltage allows larger spark plug gaps for added power, smoother response and better fuel economy. These coils are internally resisted so they are compatible with many inductive ignition systems. Black finish for that "stock look"
When using with a 'points' type distributor, installation and use of a ballast resistor such as # 547-8214 (shown below) is required. When using with an electronic distributor, or an exhaust flame-thrower kit, the ballast resistor is not required.